Many of the products at Shinola, which has a new flagship store in TriBeCa, are made or assembled in Detroit. 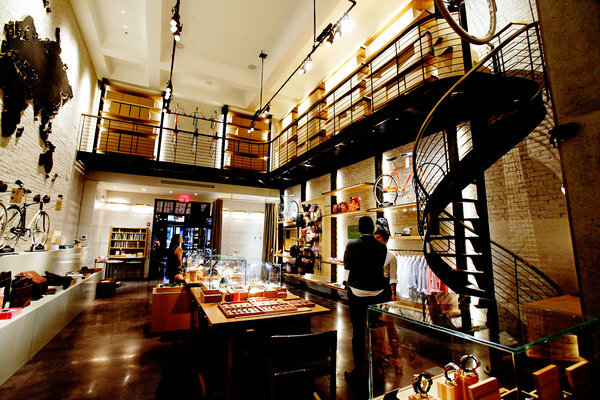 You begin to shop at Shinola not at its new TriBeCa flagship, but somewhere back in your teenage years, when social causes were first stamped into your consciousness, when you were first taught that your dollar has not just purchasing power, but also ideological power. Shinola, which takes its name from the resurrected shoe polish brand, is a relatively young company that specializes in bicycles, watches and leather goods, many of which are made in Detroit, or at least assembled in Detroit. If you want to know just how Detroit Shinola is, turn to its Web site, with its loving portraits of workers in its new factory, and its flowery odes to local artisanship. Buying something made in Detroit, in this calculus, is not much different than buying a fair trade Andean sweater. You’re buying a small piece of the revival of a great American manufacturing city gone to seed. Or at least, you’re buying into the liberal idea of what supporting a distressed economy means. Shmankruptcy, indeed. Would it cramp your ideals to know that the company behind Shinola, Bedrock Brands, was started by a founder of the Fossil brand of watches, Tom Kartsotis, and also invests in Steven Alan, among other retail brands? In essence, that makes Mr. Kartsotis a midprice watch mogul looking to go luxury under the cover of charitable business practices. Last year, Crain’s Detroit Business reported that Mr. Kartsotis commissioned a study in which people were asked if they preferred pens made in China that cost $5, the United States at $10 or Detroit at $15, and when offered the Detroit option, they chose it regardless of the higher price. And so a luxury brand was born.